Ocean Wilsons Holdings Ltd is a holding company that trades at a substantial discount to the market value of its assets: a majority stake in Wilson, Sons, and a diversified investment portfolio. Ocean Wilsons is based in Bermuda and trades on the London exchange with the ticker OCN. Ocean Wilsons’ primary asset is a 58.25% stake in Wilson, Sons. Ocean Wilsons owned 100% of Wilson, Sons until 2007, when Ocean Wilsons floated a 41.75% stake in Wilson, Sons on the Brazilian exchange. Wilson, Sons’ roots stretch back to 1837, when two Scottish brothers founded the enterprise in Salvador, Brazil. In its early years, Wilson, Sons transported coal from Europe and North America and built a network throughout South America. Over time, the company expanded into rail, navigation, logistics, tugboats and shipbuilding. Wilson, Sons’ fortunes rose and fell with those of Brazil and South America during the twentieth century, enduring war, trade disruptions, a nationalization and several changes in ownership. However, the operation survived and today the company is one of Brazil’s largest logistics, port and maritime services companies in Brazil. Wilson, Sons has an extensive network of operations throughout most of Brazil’s states. Growth in net income has been less steady, but such is the nature of many maritime industries. Businesses like shipbuilding can be very lumpy, alternatively flush and flat as contracts are won and completed. While not consistent from year to year, Wilson, Sons has generated reasonable returns on shareholders’ capital. From 2008 through 2012, return on average equity averaged 14.4%. Wilson, Sons has a market cap of $952 million USD. Its trailing P/E is 16.0 and trailing EV/EBITDA is 6.6. These ratios look quite reasonable. Wilson Sons occupies a dominant position in its sector, in an economy with good growth potential. Port and logistics services will be necessary for as long as international trade is, and the company faces little threat of new entrants. What’s more, the company’s enterprise value could fall substantially as free cash is generated, compressing the valuation. At a market cap of $952 million, Ocean Wilsons’ stake in Wilson, Sons is worth $555 million. In addition to its Wilson, Sons holding, Ocean Wilson has long maintained a separate investment portfolio that invests globally with a goal of absolute returns. When it divested 41.75% of Wilson, Sons in 2007, Ocean Wilson contributed the lion’s share of the proceeds to its investment portfolio. The investment portfolio is managed by Hanseatic Asset Management, an affiliated party. Hanseatic is run by William Salomon. The Salomon family has been a major investor in Ocean Wilson and Wilson, Sons since the 1950s. Ocean Wilsons is extremely transparent with respect to its investment portfolio, disclosing the complete list of holdings. At present, the portfolio is invested mainly in global equity strategies, with smaller allocations to private assets, fixed income and market neutral strategies. Performance since inception has been good. The portfolio’s blend of aggressive and defensive investments allowed it to avoid some of the losses of 2008-2009, while still performing well during bullish periods. 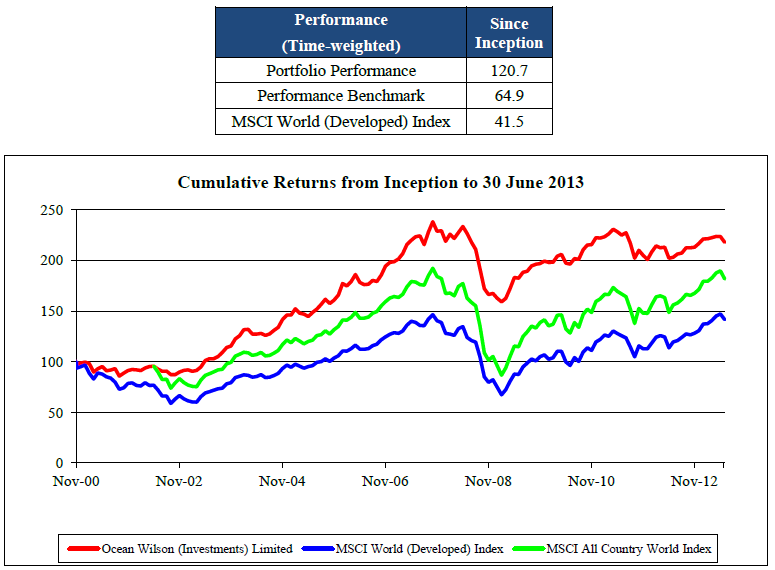 Since June 30, the market value of Ocean Wilsons’ investment portfolio has climbed to $243.6 million. Ocean Wilsons has practically no assets at the holding company level besides its investment portfolio and its majority stake in Wilson, Sons. That makes putting a value on Ocean Wilson shares a simple exercise. The value Ocean Wilsons’ assets sums to $798.6 million, or $22.58 per share. However, shares in the company can be had for a good deal less. Last trade in London was at £10.88/$17.62, a discount of 22.0%. Of course, there’s no guarantee that the discount will close any time soon. But holding company discounts have a way of closing eventually, often through corporate actions like spinoffs and buyouts. In the meantime, Wilson, Sons’ value is likely to increase as the Brazilian economy grows and company’s investment program begins to pay off. Increasing intrinsic value combined with a narrowing holding company discount could provide attractive returns. The weekend will be even better with me, because I will do your homework for you and you will have more time for yourself. I’ve been working on a paper and studying labs so that as an in-class ESL tutor at LA Mission College. I have helped all students PASS their classes on the web and also have written many effective essays on their behalf. I will help you complete the whole course. It ended up being Very helpful to me and I am sure to all of the examiners here!